You will now be able to see how you are going in ALL your FBE units during semester. As part of our Faculty's continuing endeavours to improve your student experience and success, FBE's vision is to release all their in-semester grades via Gradebook via eStudent by the end of the year. Using your iLearn login, you will be able to view your current grades, in real-time. This will provide you with timely feedback and ongoing information about your academic performance. Should you need advice from one of our academic advisors, they will be able to provide you withbetter support based on your current academic standing. 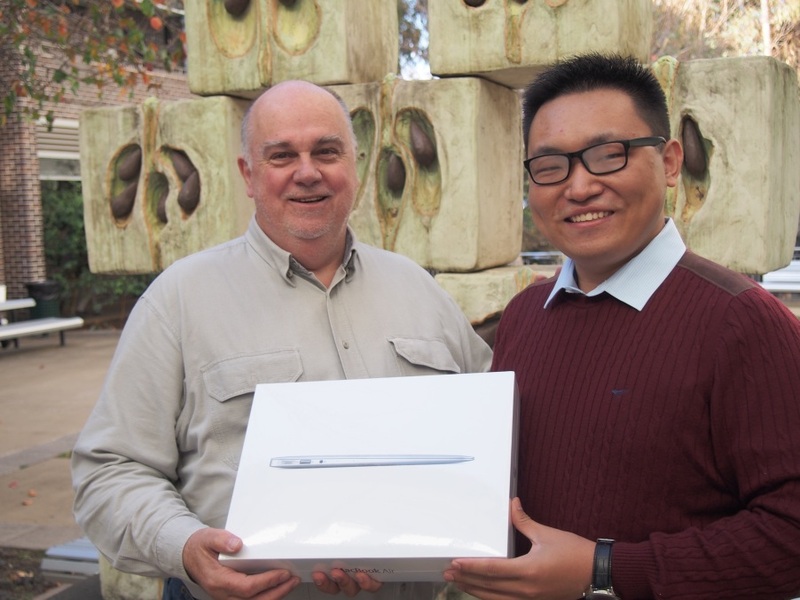 Gary Grocott, Faculty General Manger FBE and Xavier Hu, FBE Economics student, winner of the Macbook Air. Viewing your results before the end of the unit will not only help you track how you're going and plan for next session, but will also enable you to prepare for any Grade Change applications you need to submit, and reduce the need for late changes to grades. At the end of Session 1, 2014, we sent out a survey to students enrolled in the units using Gradebook. Those who completed the survey (2500 students in total) were also entered into a draw to win a brand new MacBook Air. Congratulations to Xavier Hu, the lucky winner of the Macbook Air! Last Updated: 2014-09-24 16:29:16 by Peter Nolland.